In a Dutch oven or large pot, cook the diced bacon until crispy. Be sure not to crowd the pot; work in batches if needed. Remove with a slotted spoon onto a paper towel-lined plate and set aside. Reserve 2-3 tablespoons of the rendered bacon fat. Saute the onion, celery, and garlic in the reserved bacon fat. Cook, stirring frequently for 2-3 minutes, until softened. Using a wooden spoon, scrape up any browned bits (or fond) from the bottom of the pot. Add the chicken stock and the baked potato, then bring to a simmer. Simmer for 4-5 minutes. Add the chopped broccoli pieces and return to a simmer for an addition 5-6 minutes. Season with salt and pepper to taste. Add the sour cream, shredded cheese, and most of the cooked bacon to the soup. Stir until the cheese is melted and the sour cream is fully incorporated. Remove from heat. 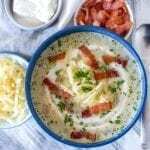 Use a ladle to portion the soup into bowls, then top with the reserved bacon, and additional cheddar and sour cream if you’d like.